Apply styles to text to give your document a consistent, professional look. 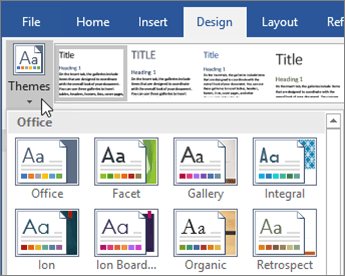 Word offers many styles to choose from. Tip: If you place the pointer in a paragraph, the style is applied to the whole paragraph. If you select specific text, only the selected text is formatted. Point to a style to preview how the selected text would look with that style, and select the style you want. Once you’ve applied Styles, you can select a theme. Point to a theme to see how it would look in your document, and select the theme you want.